As the name suggests, biopsychology explores how our biology influences our behavior. 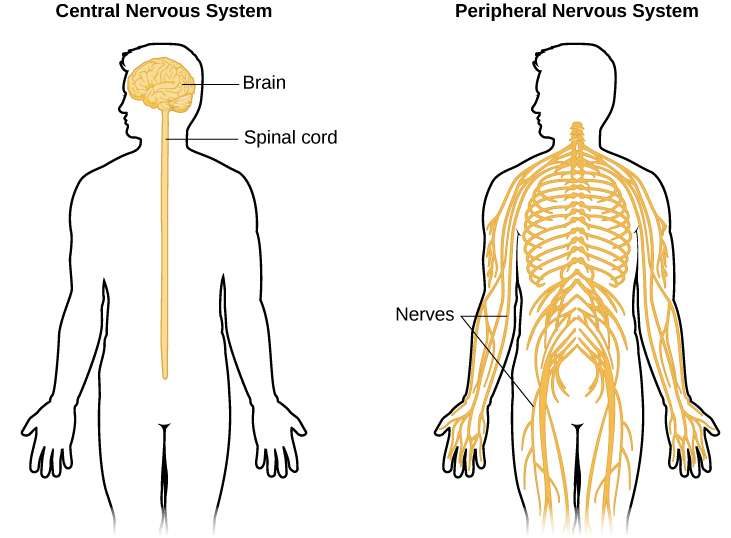 While biological psychology is a broad field, many biological psychologists want to understand how the structure and function of the nervous system is related to behavior ([link]). As such, they often combine the research strategies of both psychologists and physiologists to accomplish this goal (as discussed in Carlson, 2013). Scientists interested in both physiological aspects of sensory systems as well as in the psychological experience of sensory information work within the area of sensation and perception ([link]). 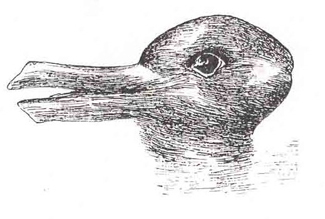 As such, sensation and perception research is also quite interdisciplinary. Imagine walking between buildings as you move from one class to another. You are inundated with sights, sounds, touch sensations, and smells. You also experience the temperature of the air around you and maintain your balance as you make your way. These are all factors of interest to someone working in the domain of sensation and perception. Early developmental psychologists focused primarily on changes that occurred through reaching adulthood, providing enormous insight into the differences in physical, cognitive, and social capacities that exist between very young children and adults. For instance, research by Jean Piaget ([link]) demonstrated that very young children do not demonstrate object permanence. Object permanence refers to the understanding that physical things continue to exist, even if they are hidden from us. If you were to show an adult a toy, and then hide it behind a curtain, the adult knows that the toy still exists. However, very young infants act as if a hidden object no longer exists. The age at which object permanence is achieved is somewhat controversial (Munakata, McClelland, Johnson, and Siegler, 1997). More recently, the study of personality has taken on a more quantitative approach. Rather than explaining how personality arises, research is focused on identifying personality traits, measuring these traits, and determining how these traits interact in a particular context to determine how a person will behave in any given situation. Personality traits are relatively consistent patterns of thought and behavior, and many have proposed that five trait dimensions are sufficient to capture the variations in personality seen across individuals. 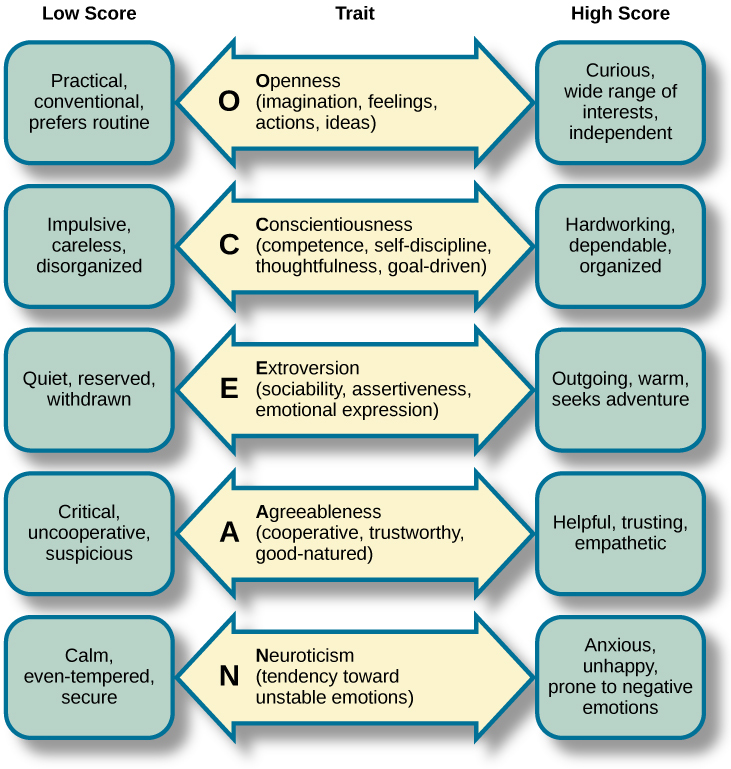 These five dimensions are known as the “Big Five” or the Five Factor model, and include dimensions of conscientiousness, agreeableness, neuroticism, openness, and extraversion ([link]). Each of these traits has been demonstrated to be relatively stable over the lifespan (e.g., Rantanen, Metsäpelto, Feldt, Pulkinnen, and Kokko, 2007; Soldz & Vaillant, 1999; McCrae & Costa, 2008) and is influenced by genetics (e.g., Jang, Livesly, and Vernon, 1996). There are many interesting examples of social psychological research, and you will read about many of these in a later chapter of this textbook. Until then, you will be introduced to one of the most controversial psychological studies ever conducted. Stanley Milgram was an American social psychologist who is most famous for research that he conducted on obedience. After the holocaust, in 1961, a Nazi war criminal, Adolf Eichmann, who was accused of committing mass atrocities, was put on trial. Many people wondered how German soldiers were capable of torturing prisoners in concentration camps, and they were unsatisfied with the excuses given by soldiers that they were simply following orders. At the time, most psychologists agreed that few people would be willing to inflict such extraordinary pain and suffering, simply because they were obeying orders. Milgram decided to conduct research to determine whether or not this was true ([link]). As you will read later in the text, Milgram found that nearly two-thirds of his participants were willing to deliver what they believed to be lethal shocks to another person, simply because they were instructed to do so by an authority figure (in this case, a man dressed in a lab coat). This was in spite of the fact that participants received payment for simply showing up for the research study and could have chosen not to inflict pain or more serious consequences on another person by withdrawing from the study. No one was actually hurt or harmed in any way, Milgram’s experiment was a clever ruse that took advantage of research confederates, those who pretend to be participants in a research study who are actually working for the researcher and have clear, specific directions on how to behave during the research study (Hock, 2009). 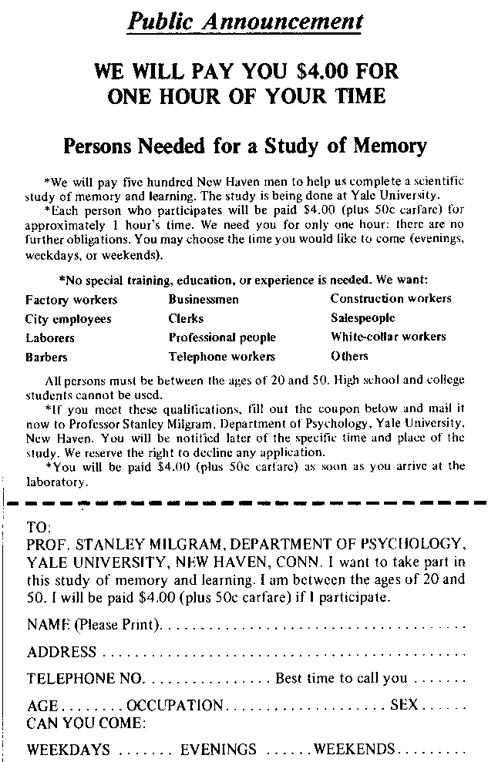 Milgram’s and others’ studies that involved deception and potential emotional harm to study participants catalyzed the development of ethical guidelines for conducting psychological research that discourage the use of deception of research subjects, unless it can be argued not to cause harm and, in general, requiring informed consent of participants. Health psychology focuses on how health is affected by the interaction of biological, psychological, and sociocultural factors. 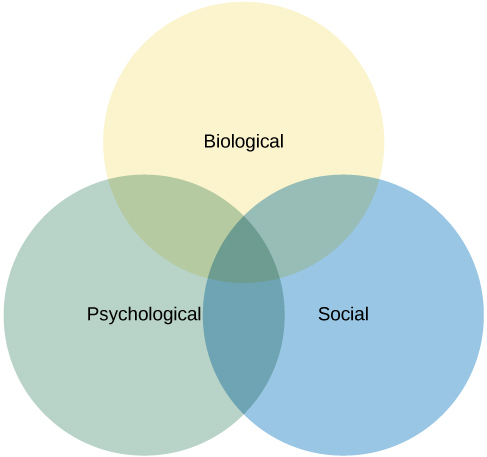 This particular approach is known as the biopsychosocial model ([link]). Health psychologists are interested in helping individuals achieve better health through public policy, education, intervention, and research. Health psychologists might conduct research that explores the relationship between one’s genetic makeup, patterns of behavior, relationships, psychological stress, and health. They may research effective ways to motivate people to address patterns of behavior that contribute to poorer health (MacDonald, 2013). 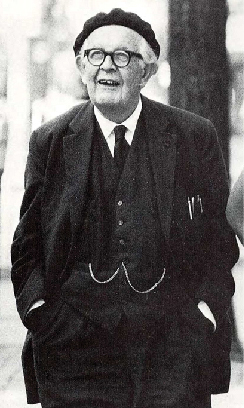 As mentioned earlier, both Freud and Rogers provided perspectives that have been influential in shaping how clinicians interact with people seeking psychotherapy. While aspects of the psychoanalytic theory are still found among some of today’s therapists who are trained from a psychodynamic perspective, Roger’s ideas about client-centered therapy have been especially influential in shaping how many clinicians operate. 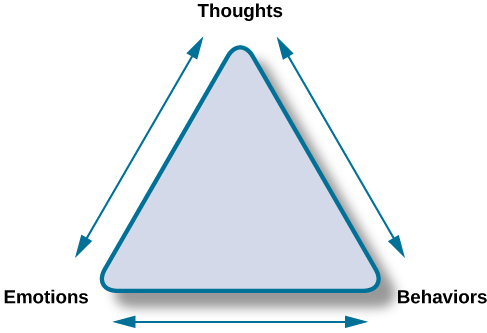 Furthermore, both behaviorism and the cognitive revolution have shaped clinical practice in the forms of behavioral therapy, cognitive therapy, and cognitive-behavioral therapy ([link]). Issues related to the diagnosis and treatment of psychological disorders and problematic patterns of behavior will be discussed in detail in later chapters of this textbook. Contemporary Psychology by OpenStaxCollege is licensed under a Creative Commons Attribution 4.0 International License, except where otherwise noted.